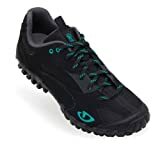 The Giro Petra Mountain Bike Shoes for Ladies is a durable and tough footwear designed for ladies that love hard-core exploration. The top part of this shoe is made from a blend of synthetic nylon and leather and the inside is lined with a nylon material. The outsole is crafted with rubber which is treaded for superb traction thereby providing better gripping with any type of surface while the foot bed is made from EVA to allow for superb wearing comfort. This shoe is compatible with the Shimano SPDs and Crank Brothers and a proper tight fit is achieved with lace closure. Manufactured from tough synthetic leather for the top material, offering a flexible, comfortable fit and shape that conforms the geometry of a woman’s foot. Adjustment for a personalized fit is achieved by the use of laces that are non-slipping and they are properly folded away in lace holders keeping them tidy and neat. Foot-bed made from EVA that has been moulded and comes with an arch support to allow for better comfort and reduce the tendency for fatigue. Comes with shanks on the inside to allow for better pedalling and enough flexing when utilized in walking. Traction provided by outsoles that are lugged, provider a firm grip on the any surface. Can be utilized with two bolt cleats that are clip-less or with pedals that are flat. The Giro Petra Mountain Bike Shoes for Ladies is a great shoe that can be utilized for variety of options. They are excellent on bikes and also for walking, providing a firm grip with any surface as well as with pedals. Cleats are not included but they can be bought separately and attached without fuss. They are however perfect with Shimano and Crank Brothers products. The material is high quality and well-made and they offer superb wearing comfort. The uniqueness in this shoe is that it conforms well to the foot, tracing every outline perfectly for a better wear and flexibility when biking or walking. For a versatile product that offers excellent comfort, this shoe comes recommended.